While attending the seminar today, I was first a little shocked at what the topic was. I didn’t realized what the seminar was going to be like, and this definitely surprised me for the good. I’ve never witnessed anyone so passionate about what they were speaking about until I heard Professor James Cone speak this afternoon about Martin Luther King Jr. and all that he has done. I was mainly interested in the comparisons that Professor Cone made between Dr King and the prophets. Dr. King’s main point was justice for the poor, a point that he thought had been forgotten and overlooked. 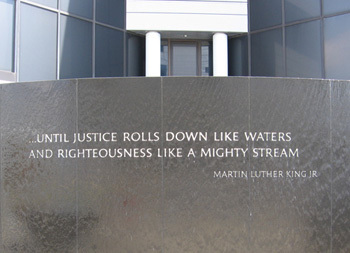 Dr. King cited the prophet Amos a lot, like when he would say “Let justice flow roll on like a river, righteousness like a never-failing stream” (Amos 5:24). Like the prophet Amos, Dr. King was all about justice for everyone, especially the poor. They were both mad at the lack of justice in the world. He also lived by the saying that “it’s always the right time to do what’s right”. Dr. King, Jesus, and Malcolm X, said Professor Cone, are all prophets who took a stand and spoke the truth. Unfortunately he also pointed out that people who tend to speak the truth also tend to be killed by others. I thought it was very interesting how Professor Cone compared Dr. King to these figures in the Bible and to the prophet Amos.